Each week, the plan has been to write more but life keeps interfering! 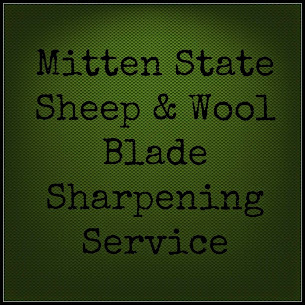 We have been busy these days, getting back into a school routine, preparing for a third cut of hay, working in wool mill, scheduling shearing for our Border Leicester ewes (first time shearing twice in one year), taking lambs to market, organizing a Fiber Arts group in our community, canning, and getting ready for a craft show! That, mixed in with the every day stuff, I have not had much time to post. I think it is a busy time for all of us. We are getting ready to take the lambs to the livestock sale. Some being almost as tall as the dams, they don't look much like lambs anymore, but it always a little sad, as it marks the end of another year of raising lambs. Another shearing date has been scheduled for this year for the Border Leicester and Romney ewes. With their wool growth, we decided to try shearing them twice a year. I have wanted to join a fiber arts group since I took an interest in spinning. I finally decided to start one myself. There have been quite a few people showing interest. Our first meeting is scheduled for next month. Wish us luck! I am on my last bushel of pears...then on to tomatoes. I sighed up as a craft vendor with a friend of mine. At this point and time, I wonder why I did such a thing, but I am sure it will all come together in the end. I will get to spend the day talking about sheep and wool, so I am sure it will be an enjoyable time. What has you busy this September? We've been been splitting wood, cleaning, purging, repairing, and cleaning out the garden. Sounds like that applefest will be fun. We haven't even started with our wood supply yet! I am in denial that cold weather is coming!! Life, back to school with a new data entry program, projects, projects, projects. I can't wait to start growing things in the greenhouse! It's busy and exciting, and on top of that, it has cooled off enough to work outside more comfortably this time of year. You know what that means....more projects! I would love a greenhouse!! What a face and such nice wool! Wow, a third cutting of hay must be a real blessing. That doesn't happen around here because the heat gets so bad. I do hope your fiber arts group works out well as it's so much more fun to do things like that when you can share with others. It was a good hay year this year, and that is always a blessing! I am really looking forward to the fiber group! You will have a blast with your group. The different personalities and styles make it so interesting. I hope to get a good group growing, I am excited about it! Fiber arts group! Wonderful! I do an adult ed fiber arts class at our school. Lots of fun! I completely understand when the farm takes over. I've been trying to scale back so I can do more writing as well. Have fun with the fiber group project, sounds neat.